Creating your custom outdoor living environment. Dr. Decks loves to make the worlds best living environments. Which will increase your livable area, in style, and help you enjoy your new extended living room outside. You could be chilling with a cold beverage listening to your booming system by RockfordFosgate in your new hot tub or swimming pool, surrounded by your family and the best man made decking in the world. Don't forget to turn on the fire pit inlaid in your deck, before you sit down on your new automated patio lounger and feast on the choice prime you just smoked in your new BBQ that comes up from your deck. The rain just came but no worries, just glide over and chill under your new aluminum and acrylic patio cover and finish the incredible meal you just prepared for you and your guests. Just Call Dr. Decks and you can invent this ending! 253-565-1122 Your Prescription for Quality. 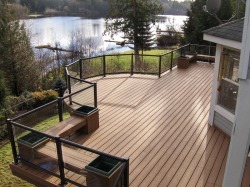 From small backyard projects to large commercial structures, Dr.Decks is one of the premiere deck builders in the South Puget Sound region among builders, architects and homeowners for custom deck construction. Known mostly for heat bending PVC decking and composite rail kits into remarkable works of art, Dr.Decks can construct your deck from any marketable plank you can acquire. We’re proud of the reputation we’ve built for over 27 years. Today, our customers and suppliers expect more from Dr.Decks, so we pay close attention to the big picture and the little details. This also means we deliver on what we promise.